Timber joined me on Apple Day – October, 2012. The sun was shining, but it was a bit chilly. 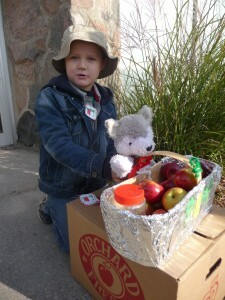 Timber was happy every time we received a donation and handed out a shiny apple. Good job Timber! Good Job Timber and Great Job Adam!